Qiagen’s QuantiNova kits have a built-in tracking system for visual identification of correct pipetting. The polymerase chain reaction (PCR), invented about three decades ago, soon entered mainstream use thanks to an ongoing series of refinements. One particularly important refinement, introduced about two decades ago, is the “real time” quantification of DNA. The idea is to trace the rising level of DNA throughout the amplification step, and not just measure the final amount of amplified product. This idea turns standard PCR into real-time PCR, or quantitative PCR. 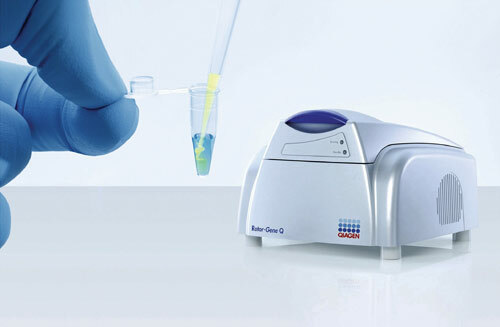 Real-time PCR has become the most widely used nucleic acid detection technology. It is routinely used in academic research, in applied testing settings such as food-safety or veterinary testing, and in molecular diagnostics. It continues to replace many older detection methods due to simple readouts, high sensitivity, and multiplex and quantification capabilities, as well as ease of use, cost effectiveness, and throughput flexibility with only moderate equipment investments. According to Peter Urbitsch, Ph.D., head of the global assay technologies business at Qiagen, real-time PCR technology has evolved and diversified in multiple directions. Available formats include tubes, microarrays (96-, 384-, and 1,536-well plates), and capillary and rotor variants. Detection principles include SYBR green and probe-based detection, with the latter being increasingly diversified into FRET, Scorpions, TaqMan, and others. In addition, multiplex detection formats are being developed using different dyes and quencher molecules.